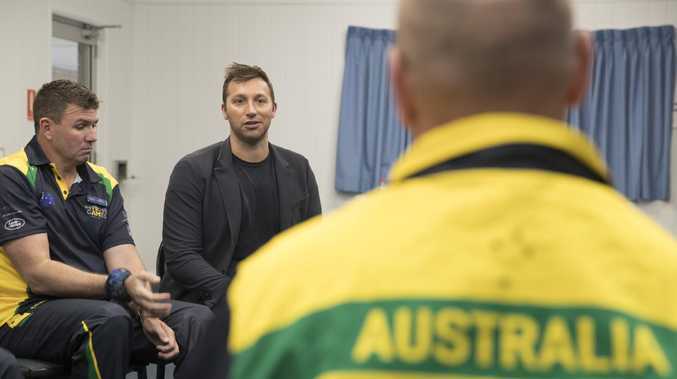 Australian Olympic swimming legend Ian Thorpe speaks with the Australian Invictus Games swimming team at the Sydney Academy of Sport and Recreation. AUSTRALIA'S reputation as a sporting nation is endangered by a broken funding model, a group of Olympic champions say. Swimming legend Ian Thorpe and 42 other Australian former athletes have written an open letter pleading for a rethink of the current funding model. "When our glorious record of achievement at the Olympic, Paralympic and Commonwealth Games is substituted for a pathetic funding version of the Hunger Games, you know it's time to say enough," the athletes wrote in a letter published in The Australian newspaper on Wednesday. "Our reputation as a sporting nation and as a nation of healthy, optimistic people is under threat. "As our results slip so does Australia's reputation, especially as we now are bronze medallist as the most obese nation in the English-speaking world. It is a gold medal we don't want to win." Australia's medal hauls have slipped at every Olympic Games after the Sydney 2000 Games and a fresh funding model has been initiated by Sport Australia, the body responsible for divesting government funding. Under the new model, more emphasis will be put on grassroots sports instead of medal tallies at major international events such as the Olympics. "We were inspired by the efforts of the men and women who went before us," the athletes' letter said. "The athletes of today would love that opportunity themselves, to inspire young people to strive for an active lifestyle and excellence. "But when our current generation of athletes and future Olympians and Paralympians are forced to crowd source for the funds to represent Australia ... you know that we have a funding model that is broken. "Sport is not a charity case. It is an investment in our national wellbeing. "High performance encourages participation. Participation produces healthy outcomes for children and adults alike."